Thanks, Ed. But my neighbor can’t know or experience the love I am commanded to have for him unless I spend some time with him. And I find it really hard to feed my brothers and sisters who are hungry sitting here in a room. And making more disciples is really extra difficult sitting here in a room by myself. Better disciples? Harder yet. Visiting in prison? Wow! Can’t get that done here in a room by myself. Widows and orphans probably find it inconvenient to wait while I get this ‘a long time in a room by myself’ thing worked out. A little solitude and contemplation can really be a blessing to me. A lot of it doesn’t help anyone. It has only been when I have come to a place of contemplative prayer that I gained strength and peace. This practice has revolutionized my life and taken the shackles off my feet. I still engage in servant love expressed through praying and visiting the sick, feeding the hungry, clothing the naked, and fellow shipping regularly. However, I now take time to mediate, pray, sit in silence, and listen to God speak. This new liberation and freedom has lead me to deeper hard felt service and intimacy with Christ. I’ve spent years involved in prison ministry, so I don’t see this as either or. If anything, evangelicals have been all service and no contemplation. Richard Rohr calls his ministry The Center for Contemplation and Action with the goal that contemplation drives our ministry forward. I think the false dichotomy you describe is why evangelicals are so afraid of stopping to recharge with contemplation. We’re so afraid of not doing enough. We’re so afraid of stopping our service to seek God’s presence that we can’t imagine how the pursuit of God would lead us into the pursuit of our neighbors and service to others, and so we skip the contemplation and then wonder why we’re so burned out and distant from God. Of course they go together, but contemplation is one of the most powerful forces for spurring us on to action. In my experience guilt trips or judgment or calls to “prove” yourself or to “obey” if you want to be faithful cuts out the essential aspect that those who are loved by God will have a deep well to draw from in their ministry. I also found that many evangelicals are ‘fearful’ of the contemplative life because it seems ‘new age’, ‘Catholic’ or worse yet dangerous and deceptive! I think that’s our problem Judy- God also commands us to “be still and know he is God” in addition to the multiple places in the Bible that refer to us resting in God (including Sabbath laws). In our fever to do so much in this world (and the accompanying guilt we foist on ourselves for never doing enough) we never stop to consider when our work is done and when we can rest in the fact that it is God who holds the universe together, not our efforts. I think the author is getting at us BEING people who live our lives out in faith (even when it means “inaction” in the eyes of the world), resting in the very Love that makes all those good actions you speak of actually worth worth the effort. At least that’s my take. “A lot of it doesn’t help anyone.” This is so incredibly untrue. God speaks in the still small voice. If you’re going to be any real use, spending time in the silence is where it all begins, where it is deeply nurtured, where it matures and bears fruit. The author of the post did not say ANYWHERE that one should also give up all practical daily interactions–that’s a knee-jerk takeaway, and one that’s in error, IMO. The most effective way to influence others is to be someone in whom a profound receptivity to the Still Small Voice is the ultimate foundation. MAKE disciples? No, no, no. That’s not your job. I think you clearly missed the point. Both are important. Nowhere does the article day to sacrifice one for the other. Judy, I don’t think Ed is saying that time alone is all we need to do. We tend to overvalue certain aspects of following Jesus. Ed nails a temptation we have as evangelicals to emphasize activism at the expense of time alone, listening. Solitude and contemplation isn’t just a blessing to me, it better positions me help a lot more people. I’m always challenged that Jesus didn’t just do a little of it; he made time alone a priority in his ministry, even being led into the wilderness for quite some time (think of all the work he could’ve done during that time!). And then all the times he was off alone with the Father when the crowds were waiting for him. It appears that for Jesus, time alone was right there alongside (not instead of) the evangelism and activism you mention. You also mentioned widows and orphans, from James’ letter telling us believers to get to work! (1:22, 27). As I was reading Ed’s post, I’d add that evangelicals could use some of James’ other advice, to be “quick to listen.” That’s something that I see lacking in evangelicalism today, and more importantly, lacking in my own life. My “quiet time” or time alone doesn’t always mean I’m listening. I’ve found that listening only works when we’re silent. Richard Foster’s “Streams of Living Water” really helped me understand how activism and contemplation (as well as several other emphases in Christian practice) need one another. Highly recommend it. Hey Ed, it’s been a while and when I saw a link to this post on FB I had to read it. I feel, within me the anxiety, fear, and anger you describe. I hear it in others voices and questions. My One Word for this year is simplify and I am find that it is hard to simplify because in simplifying so many props have to be knocked out and the anxiety level goes way high. But it is one of the things that we need to practice as we sit quietly in the room. I remember that I would pass a Quaker meeting house once in awhile during my undergrad days and when the weather was warm they would have the windows open and the silence drove me nuts as I walked passed! Maybe we need to start a weekly worship service where we sit in the room together and in silence! Ed, this is so timely. My one word this year is abide. I have the book given to me when I first became a follower of Jesus, Experiencing the Depths of Jesus Christ by Madame Guyon. It was also known by the title Short and Very Easy Method of Prayer. I’ve read it before, but didn’t understand it. 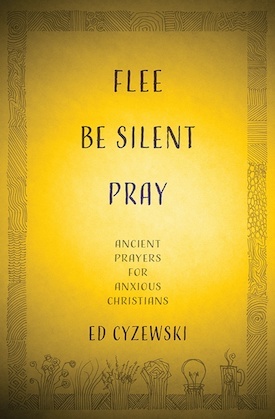 Your article compelled me to pull out this book again for she talks and describes contemplative prayer and the life of the believer hidden in Christ. The just being and love in His presence, and it in turns becomes love lived out. God’s desire to reveal Himself to us. From just skimming the book just now and your article, I have this desire for the Presence of God and simplicity of the contemplative prayer. I’ve been in the place you’ve described, and I can’t go back to the turmoil. Well said, Ed. Raised Catholic I know about contemplative prayer. Having spent years in the Baptist Church I learned to love Scripture…and then I returned to the Catholic Church. There are many in the CC who are like me: we love Scripture and also love the time of quiet prayer that is such a tradition in our church. You sound like you’re at a good place now. One that will be with you throughout your life. Beautiful Ed..so rich..contemplative practice at its best is like perhaps returning to the womb. I also meditate on scripture..taking captive every thought to Christ..I wrote on this subject in my blog last week. Yet, I am so encouraged by your own journey. “We desperately need silence. We need to learn what it means to abide. We need to learn what it feels like to finally be still before God for a long time.” I know how much I need this and I still don’t do it as much as I should. The time spent alone with God not only strengthens my faith, but it enables me to reach out to others with love rather than judgment. Thank you for this timely article, Ed. Blessings to you and your family, May God grant a smooth transition as you move to a new place.